A hustle waiting for a hustler? “I am just returning from my lunch. I show you my cameo factory,” Giovanni told us in what must have been a well-practiced and rehearsed broken English. He bid us to enter the “showroom” to his “factory.” There, we met his “brothers” and other “family” members, engaged in various phases of cameo making. The hook (or “the prestige” of this little kabuki dance was the tray of cameos that one of Giovanni’s other “brothers” produced from its display case. “You need a gift, perhaps?” Giovanni asked with a lamb’s innocence. To his credit, he did eventually take us to the castle entrance and ticket booth (where possibly he earned an additional hawker's fee?). One of Giovanni's "brothers" at "work" in the "factory"
How am I so sure this was a hustle? Because, later when Carol searched Trip Advisor for the accurate spelling of the cameo place, she stumbled upon several first-hand accounts going back more than five years. In these stories, tourists recounted an approach from a certain Giovanni, “just returning from his lunch,” and only too happy to show them his “factory,” while assisting them to find the castle entrance. They all bought broaches, as we would have too, had Carol been one to wear them. It was a genteel, almost warm, soft hustle that neither Carol nor I minded at all. What I'm certain was not a hustle, but certainly could be structured into one in time for the summer tourist season, happened to us while looking for the laundromat later after arriving in Villa San Giovanni near the toe of Italy’s boot. Not finding street names, we asked a man loading his car outside his apartment for help. He gave us directions, apologizing for his poor English, and we thanked him. A minute or so later, he passed us in his car, and now offered to drive us to the laundromat. The streets were hilly and we still weren't sure we could follow his directions on our own, so Carol, myself and two bags of laundry sandwiched ourselves around him and his companion, and off we went crammed in a Fiat barely designed for two. He did not take us to the laundromat we were looking for, but instead dropped us off in front of a dry cleaners “that was much better and closer to us” than what we'd been looking for. Following a complete inventory of every stitch of laundry we unfurled for them, we were told it would be ready by next Tuesday (it was Saturday). And the price was 80 euros. We'd invested a lot of time at this point, and neither of us were fond of the idea of taking everything back and trying to find the original laundromat, so we gave them a 50 euro downpayment, and briefly considered looking for a flea market to find some clothes to last us until Tuesday. Instead we settled for using the dry weather to our advantage, and rinsed out what we were wearing over the next couple of days. Not worth 80 euros, but aren't they just beautifully folded and packed? I'm sure if the car driver and the dry cleaner could put their enterprising heads together, they could make a killing when the tourist hordes hit the italian boot this summer. I later rationalized the 80 euro cost, as opposed to the 10 it might have cost at a laundromat, by suggesting we didn't have to spend the day doing the wash ourselves, and the 80 euros did neatly match the 80 euros I was able to negotiate away from a mistaken non-refundable reservation I'd made earlier. 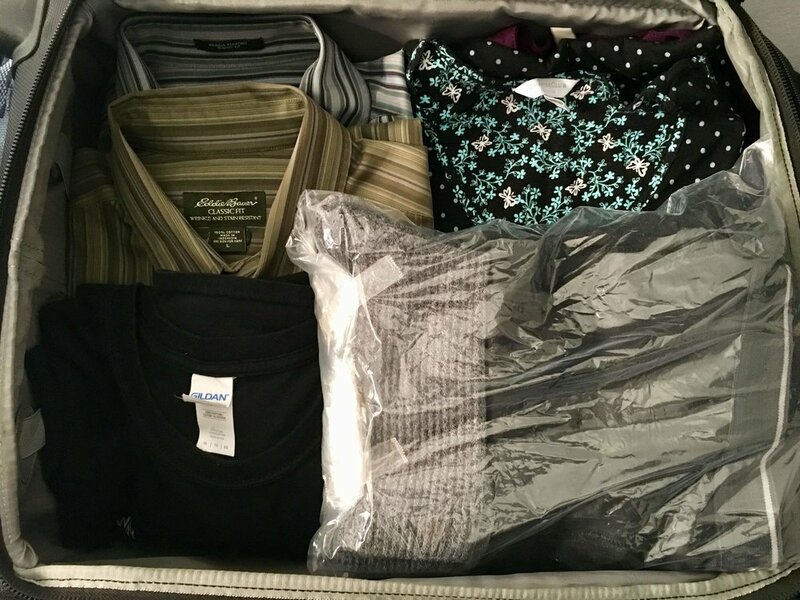 Plus our clothes came back, clean, neatly folded, undies shrink wrapped and, all in all, the most wrinkle-free of the entire trip.